On this Easter Sunday which coincides with Passover we usually contemplate the divine. This week's film deals more with how to err is to be human. 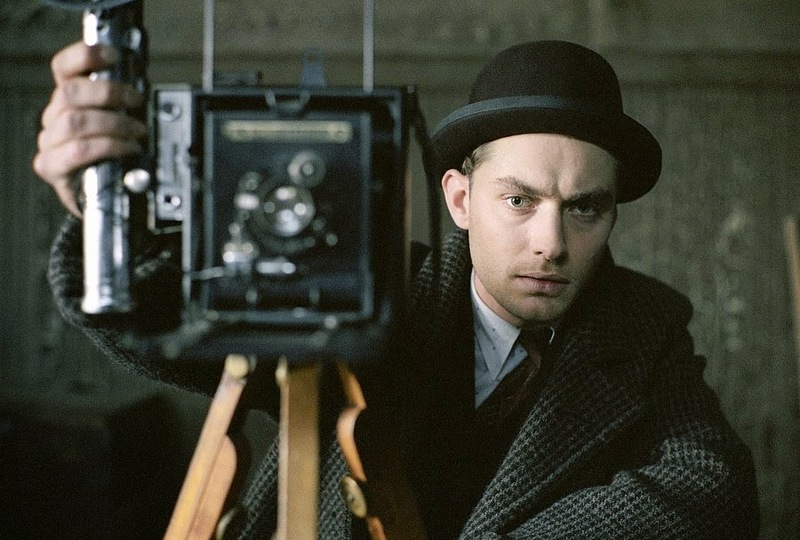 The Sam Mendes Depression era film is a road movie in many ways. 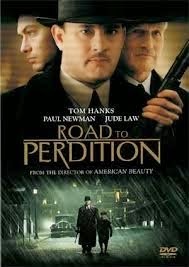 There are actual roads on which Tom Hanks' Michael Sullivan and his son must ride to combat and escape the gangsters pursuing them in order to reach the physical town of Perdition. It is there that Sullivan hopes to find safe haven among relatives, which is ironic, since the meaning of "perdition," is the place where all hope is lost. But, there is also the symbolic road to "perdition," which, in religious terms, means hell. Sullivan is a hit man for the gangster Rooney, played by Paul Newman. But, the older criminal is more than that to Sullivan; he is a surrogate father. They are seen playing a piano duet, and there is more affection exchanged in the glances between these two than they show toward their actual sons. The movie is about family to a great degree. Rooney's real son, Connor, played by Daniel Craig, is a spoiled, selfish man, who skims money from his own father, and is jealous of Sullivan's place in his father's heart. But, Rooney loves him and tries to protect him. After Sullivan's son witnesses Connor murdering a disgruntled gangster, he goes to Sullivan's house to kill the boy. Once he is discovered in Sullivan's house with a drawn gun, Connor feels that he must kill Sullivan's wife and the younger brother. The older son escapes, and Sullivan knows he must protect his remaining child. Sullivan's son says that some people saw his dad as having good in him and others found no good at all. There is a continuum of evil here. Rooney at one point says that there are only murderers where they are. This is the life they have chosen, and there is no salvation for them. But, Sullivan says there is hope for his son, and other than revenge for the deaths of his wife and other son, that is his goal. As Sullivan hits the road with his son, they become closer, and the warmth that grows between them is mirrored in the weather, as it changes from winter to spring. At the other end of this evil spectrum, Jude Law's character, Maguire, as the assassin who Capone's people send out to kill Sullivan so he won't kill Connor, is totally immoral. As a crime scene photographer, he takes pictures of the dead, including pictures of his own victims. He says taking photos of the dead makes him feel more alive. But, the photos of the corpses are, in a sense, his only family pictures. When your life revolves around the dead, how alive are you really? 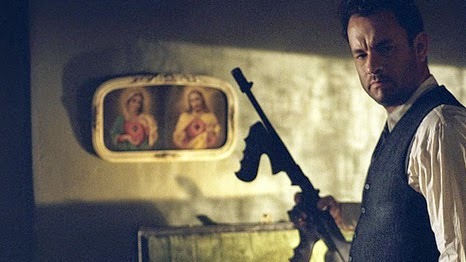 There are Catholic references in the film that are facades which cover up the darkness in the characters and their actions. In this respect, the film has some shades of The Godfather. There is a wake at the beginning held in Rooney's home for a murdered gangster; however, it is Rooney who ordered the hit. There are religious pictures in rooms where violence takes place. Sullivan seeks Rooney in a church using it as cover for their meeting. They discuss murderous acts in the basement of the church, which contains discarded religious statues that make the place appear as a kind of gothic subterranean crypt for lost faith. In counterpoint to Jesus on the cross, there is double crossing here. Rooney betrays his subordinates. Connor steals from his father. Frank Nitti, in Chicago, first helps Rooney, and then, after Sullivan kills Rooney, helps Sullivan kill the loose cannon Connor. In the end, Nitti also finishes cleaning up the mess by having Maguire kill Sullivan. But, before he dies, Sullivan kills Maguire so that his son will not do the deed, thus halting his offspring's journey to spiritual perdition. Tom Hanks almost always plays a good guy. Do you think he pulls off this role of an outlaw? Next week’s movie is Chinatown.